November 21, 2014 CLEVELAND, OH – Mace Security International (OTCPINK: MACE) (“Mace® Brand”) announces a return to a core business of supplying less-lethal tactical munitions and weapons systems for law enforcement, corrections and military markets. Through its subsidiary, Mace Tactical Solutions, the Company has recently expanded its offerings to a complete line of chemical/impact munitions and flash/distraction/impact grenades to its law enforcement, corrections and military customers. Mace® Brand now offers these customers a “one-stop shop” for acquiring supplies needed to perform and train for their invaluable duties. 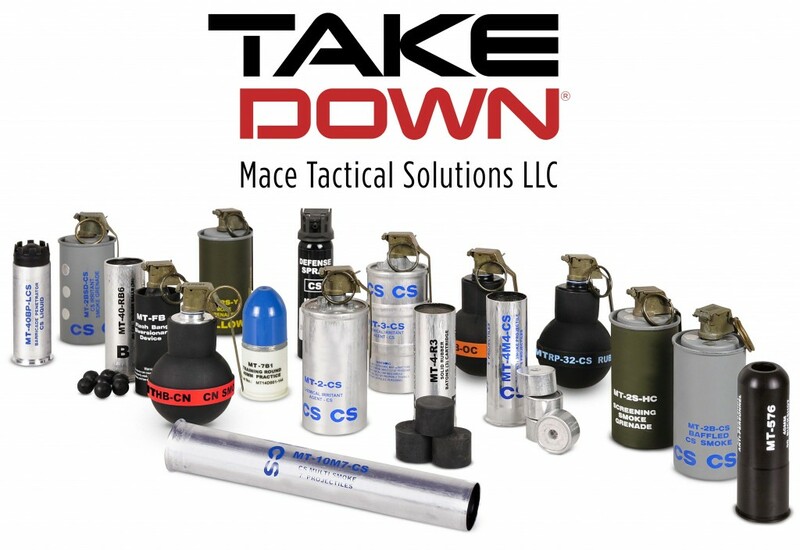 “Mace Tactical’s comprehensive new offering of Take Down® less-lethal products aligns perfectly with our Company’s current distribution channels and is another giant step by Mace® Brand toward offering the most complete solution to law enforcement and tactical organizations across the country,” said John McCann, Mace Security International’s President and CEO. Just like the history of the world-famous Mace® Brand pepper spray dates back over a half a century, Mace® Brand’s history of supplying law enforcement, corrections and military personnel with a complete line of less-lethal munitions and weapons goes back over twenty years ago when Mace® Brand was a leading supplier to law enforcement officers across the country via its former Federal Laboratories division. “Today, Mace® Brand is proud to return to its roots with a full and broad offering of innovative and reliable less-lethal Take Down® branded products and solutions,” said John McCann, President and CEO. Mace® Brand will provide more details about the products and its plans in the month of December, prior to Mace® Brand’s participation in the SHOT Show in Las Vegas from January 20, 2015 through January 23, 2015. Anyone interested in more information before this show can contact Eric Crawford directly at ecrawford@mace.com or Doug Melzig at dmelzig@mace.com. 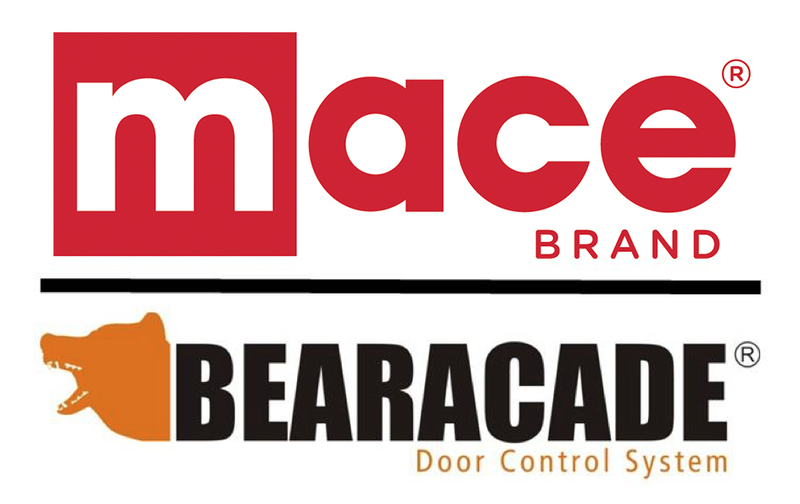 Cleveland, OH – 11/10/2014 – Cleveland, Ohio-based Mace Security International, Inc. and Hudson, Ohio-based National School Control Systems, LLC are pleased to announce a joint marketing agreement for safety and security products with the focus on the Bearacade® Door Control System. The target markets for these systems include educational, corporate, nonprofit, and government institutions. National School Control System recently was selected by Campus Safety Magazine as BEST 2014 Physical Security Device for their patent-pending Bearacade® Door Control System. Bearacade has been adopted as part of the emergency operations plans of 72 schools and institutions in 17 states in the US. The device is designed for hostile intruder and active shooter incidents where it is safer to shelter in place than evacuate. 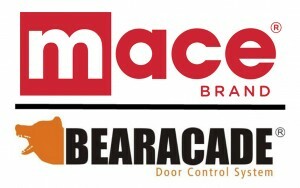 Bearacade deploys in seconds on interior classroom and office doors, securing inward and outward-swinging doors, thus providing valuable time before law enforcement arrives. Bearacade® devices are available for shipping today. Products from both companies are on display and being demonstrated this week at the Ohio School Board Association’s Capital Conference and Expo at the Greater Columbus Convention Center in Columbus, Ohio. Formed in Hudson, Ohio in May 2013, National School Control Systems was formed around the patent-pending and trademarked device, Bearacade® Door Control System. National School Control Systems provides Emergency Operations Planning consulting and wayfinder signs for schools and businesses. Mace Security International will be presenting at the Midwest Investment Conference event taking place at the Cleveland Convention Center on Tuesday, Nov. 18, 2014. The highly anticipated conference is hosted by CFA Society Cleveland, a non-profit professional organization dedicated to providing investment-related programs and services to area investment experts. Mace Senior management will present in general sessions, and host one-on-one and small group breakout meetings with qualified institutional portfolio managers and analysts during the event. Additionally, Mace Security will conduct a field trip and tour of the manufacturing facility for all interested investors. The field trip and tour will take place on November 19th, 2014. The field trip and tour will start promptly at 9 am and will conclude at 11 am. All investors interested in the field trip can sign up by contacting Jessica Adanich at Mace Security International via email jadanich@mace.com or by calling 440-424-5321 request extension 119. Mace Security International corporate offices are located in Mid-town Cleveland and within minutes of the Cleveland Convention Center. Mace® Reports Unaudited Financial Results for the Third Quarter Ended September 30, 2014. CLEVELAND, OH, November 3, 2014 /PRNewswire/Mace Security International Inc., (OTCPINK: MACE) today announced unaudited financial results for the third quarter ended September 30, 2014. Net sales for the third quarter of 2014 experienced a 13% increase, compared to third quarter 2013. Operating loss for the third quarter of 2014 decreased 75%, compared to third quarter 2013. Net loss for the third quarter of 2014 was $ (0.01) per share, both basic and diluted, compared to a net loss of $ (0.02) per share, both basic and diluted in the same quarter a year ago, an $820,000 or $0.01 per share improvement. EBITDA for the third quarter of 2014 was a loss of $291,000, compared to a loss of $1,063,000 for the third quarter of 2013, a $772,000 improvement for the quarter. EBITDA, adjusted for one time charges for the third quarter of 2014 was a loss of $135,000, compared to an adjusted EBITDA of $470,000 for the third quarter of 2013. “Sales for the third quarter of 2014 improved from prior year third quarter and are significantly higher than second and first quarter of 2014 with 21% and 31% sales increases, respectfully. Sales through our Consumer channel for the third quarter were up 52% over prior year third quarter sales and almost equaled this year’s first and second quarter sales combined. The increase in sales through our Consumer channel is a result of sales to new customers and existing customers expanding their breadth of our products” – stated John McCann President and CEO of Mace Security International. Mace will conduct a conference call on Wednesday, November 5, 2014 at 4:15 PM EDT, 1:15 PM PDT to discuss its financial results for the quarter and nine months ended September 30, 2014, provide an update on the business, and respond to questions. The participant conference call number is (877) 719-8065, conference ID: 29566453. Presentation materials for the conference call will be available Wednesday, November 5, on Mace’s website under Investor Relations, Shareholder Transcripts & Presentations. There will also be access to a digital recording of the teleconference by calling (855) 859-2056 and entering the conference ID: 29566453. This will be available from two hours following the teleconference until December 6, 2014. A full set of the Company’s Consolidated Financial Statements can be accessed through its website: http://corp.mace.com/investor-relations/annual-reports . Mace Security International, Inc. (OTCPINK: MACE) is the manufacturer of personal defense products and markets such products and electronic surveillance products under the well known brand name Mace®. www.mace.com. Contact Information: Mace Security International, Inc., 4400 Carnegie Avenue, Cleveland, OH 44139. Email to: john@mace.com . John J. McCann, President and Chief Executive Officer, 440-424-5322.